Bamboo Kubaton Keychain - Matte Black | BUDK.com - Knives & Swords At The Lowest Prices! Who says self defense can't be convenient and stylish? Not us! This distinctive bamboo-shaped kubaton offers effective foe-stopping power in a design that's compact, easy-to-carry and undeniably chic. Best of all, it's discreet! 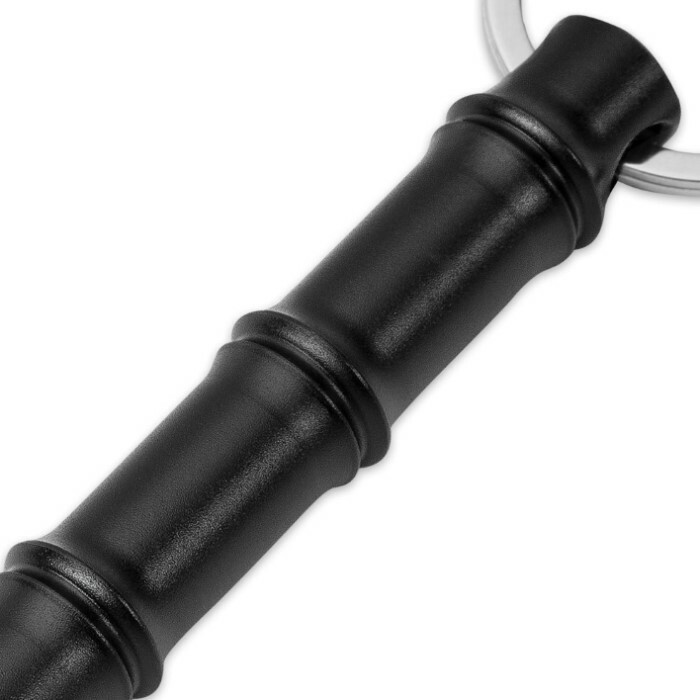 As a functional keychain, it's easy to keep on your person at all times without drawing unwanted attention - perfect for situations and/or locations where you can't carry a firearm, knife or other more traditional weapons. But while this cool kubaton may very well be your last line of defense during an attack, don't think of it as a "last resort." That's selling it far too short! Made of heavy duty aluminum, it boasts a bitter, penetrating point that's more than than capable of disabling even the most tenacious assailant. Yet it's completely safe for everyday carry and use! Assaults and muggings are almost always sudden and wholly unexpected; accordingly, you need a self-defense solution that can be dispatched safely and effectively at a moments notice. There's no time to fumble with your holster safety strap, draw your handgun, aim and fire. Those few seconds are a few seconds too many. Thankfully - unlike guns and knives - you can safely carry this versatile kubaton wholly unsheathed - always poised and ready for action, even at a moments notice. Got keys? Got life? Wanna jazz up those keys? Wanna protect that life? If you answered "yes" to any of these questions - and unless you're a zombie or Dracula you most certainly did - then order this awesome bamboo-shaped kubaton keychain today!